The “post-truth” issue is intimately tied to the ability of powerful people to fabricate victimhood. Screenshot. 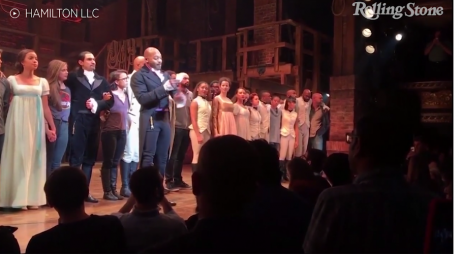 Cast of Hamilton's message for Mike Pence.A disclaimer: by the end of this article, I am going to have transgressed Godwin’s Law. I hope that I will have done so in a faintly relevant way, though, rather than simply screaming “NAZI” at something I find disagreeable, so please do stick with me in the interim. Until then, I want to discuss the appropriation of victimhood. By this, I don’t mean what some have termed “Victimhood Culture”. Broadly speaking, this is the idea that certain aspects of modern culture are characterised by people embracing victimhood (if not necessarily self-defining as victims) and (over-) interpreting perceived slights as evidence of broader systemic injustice or prejudice. The “appropriation” of victimhood seems more specific than this (or possibly a subset of victimhood culture, if you grant the validity of that category). To be exact, it is the appropriation of victimhood by groups who have traditionally enjoyed privileged status, who oppose progressive values and societal change, and even those who are arguably purveyors of oppression. This phenomenon (and the term “appropriation of victimhood”) is neatly captured in Antonio Golan’s blog post on Rush Limbaugh’s reaction to the vetoing of Arizona Senate Bill 1062, which would have allowed business owners to discriminate against LGBT people on the basis of religious belief. At the time, Limbaugh said that then Governor Jan Brewer, who eventually vetoed the bill, had been “bullied” by the “homosexual lobby” to further the “gay agenda”. Golan writes that Limbaugh’s response involves not only “denying the victimization of the LGBT community, but actually appropriating its victimhood”. He further notes that this is a common tactic of bullies. The reason I would hesitate to subsume this under the title of “victimhood culture” is that it would fail to note the power disparities involved. Which is not to say that those who espouse “progressive” values are beyond criticism when claiming discrimination. There may well be valid reasons to be concerned about certain instances of people doing so overzealously, or at least for having reservations about how such claims impact on our society and culture. For instance, an interesting example comes from Peter Tatchell, a famed campaigner for LGBT rights, who has written about his concerns over a legal ruling in which a Christian-run bakery in Northern Ireland was found guilty of discrimination for refusing to produce a cake with a pro-gay marriage message iced on it. Tatchell says that this sets a “worrying precedent” since it criminalises discrimination against “ideas” rather than discrimination against “people”. This may well be a reasonable concern, since there is no guarantee that the legal apparatus in question will always be controlled by people with compassionate social values. Tatchell therefore highlights the need to be cautious about social manifestations of victimhood, even when we agree with the values of those claiming it. Nevertheless, the fundamental fact is that that many minority groups have a right to be sensitive to discrimination, since they have experienced oppression for decades, centuries or longer. This is certainly not something you could say of Rush Limbaugh or the anti-gay religious right. They may see themselves as victims, but it is only insofar as they perceive themselves as suffering a loss of privilege and power. They decry not true bullying, but the loss of their culturally protected right to bully others with impunity, the fact that society has rejected their archaic values. This makes it a very different proposition. And this form of appropriating victimhood appears to have become a favourite tactic of the far-right in recent years. Donald Trump’s successful presidential campaign was heavily premised on precisely this. The idea that his refusal to be “politically correct” represented speaking truth to power. The notion that a self-proclaimed billionaire businessman was somehow an “anti-establishment” candidate. More recently, too, we have seen him demand an apology from the cast of Hamilton, whom he claims were “very rude” to the VP-elect Mike Pence, despite all available evidence to the contrary (the “post-truth” issue is intimately tied to the ability of powerful people to fabricate victimhood). There are, of course, many examples not directly attributable to Donald Trump. But possibly the most sinister is the concept of “white genocide”: the idea that immigration in Europe and America has been engineered by political forces to achieve the extinction of white people through forced assimilation. For the time being, the term “white genocide” remains the reserve of the conspiratorial far-right. But the ideas that this fringe propagates are increasingly entering the mainstream, such as with alarmist articles in UK national newspapers about the decreasing white population and the “white minority”. Here we see an extreme form of victimhood appropriation: the claim made by members of a traditionally dominant majority that increased racial diversity is tantamount to the kind of extermination suffered by various minority groups at the hands of powerful, violent oppressors throughout history. Which is where we get to Hitler. The reason that Hitler and the Nazis have become obvious reference points for authoritarian evil in our cultural discourse, especially online, is because they orchestrated possibly the most horrific system of mechanised murder and oppression ever witnessed in history. The Holocaust claimed the lives of around six million Jews, along with five million non-Jewish victims, including homosexuals, Roma Gypsies, Jehovah’s Witnesses, people with disabilities, leftists and others. Only the most ardent racists and far-right extremists deny that the Holocaust took place. And Hitler and the Nazis’ war crimes extend far beyond even this. As such, in our political and historical discourse, the Nazis are definitively victimisers, not victims. This becomes obvious if think for a moment about Nazi propaganda, in which Jewish people were frequently characterised as disloyal traitors who betrayed Germany during the First World War. The Nazis might have been fascinated by the idea of racial superiority, but they first and foremost considered themselves victims of historical and social injustices. The black-haired Jewish youth lies in wait for hours on end, satanically glaring at and spying on the unsuspicious girl whom he plans to seduce, adulterating her blood and removing her from the bosom of her own people. The Jew uses every possible means to undermine the racial foundations of a subjugated people… The Jews were responsible for bringing negroes into the Rhineland, with the ultimate idea of bastardizing the white race. Is it a coincidence that this is remarkably close to the idea of an engineered “white genocide” through assimilation that is gaining mainstream popularity again today? Of course not. Those who claim there is a “white genocide” in progress are the inheritors of the hateful ideology once spread and propagated by the Nazis. They even still blame it on a Jewish conspiracy. And why should we expect it to have changed? Anti-Semitism, after all, is one of the oldest examples of the appropriation of victimhood, from hatred of Jews in antiquity, through the invention of “blood libel” and subsequent persecution of Jews in Europe in the middle ages, right up to today’s conspiracy theories about the Rothschild family and similar paranoid fictions. The scary thing is precisely how little we have changed. How ready we are to blame social ills on minority groups by appropriating victimhood and casting the other, whomever they might be, in the role of oppressor to justify our hatred. How easily we forget about what this can lead to. Is Donald Trump the next Hitler? Probably not. He is part of the very establishment he set himself up as an alternative to. A populist opportunist whose actions so far as President-elect suggest that he is as happy to turn his back on campaign promises as he was to ignore facts during the campaign. But he has stoked an atmosphere in which an ideology like Nazism could prosper. And unless those opposed to racism and bigotry can offer some kind of organised resistance, as well as an alternative vision of the future, the self-proclaimed “victims” who comes after Trump could be far worse.